This verse adorns the walls of three schoolhouses in the region of southeastern Bangladesh known as the Chittagong Hill Tracts. Each was written by a Vermont author, translated into the indigenous languages Mro, Marma and Chakma and hand carved into mahogany planks. About 8,000 miles separate Vermont and Bangladesh, but an extraordinary project is bridging that distance in a most unusual way. Endangered Alphabets is an ambitious linguistic-art project created by Burlington’s Tim Brookes, a writer, artist and instructor of professional writing at Champlain College. 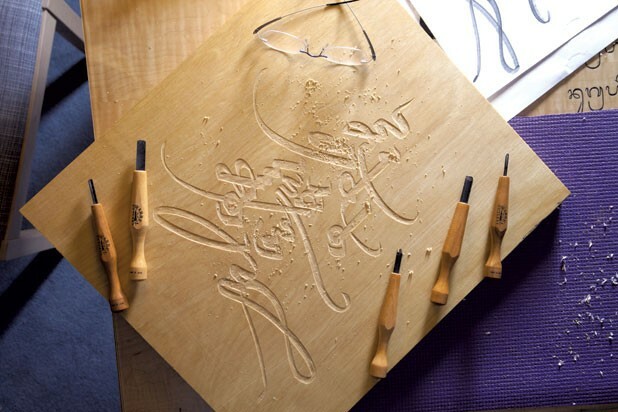 Physically, it consists of well-polished wooden plaques, into each of which Brookes has carved a text in one of the world’s many dying languages — that is, those spoken or written by a small and dwindling number of people. In recent months, Brookes, 60, has struck up two unusual partnerships that are bringing his work to far-flung locales and expanding Endangered Alphabets’ purview. He’s astonished at how the project has grown and metamorphosed since its inception in 2010. “It’s a constant series of surprises,” Brookes says. Few people speak Mro, Marma or Chakma anymore, even in Bangladesh. Political and cultural forces have confined these languages to small geographical areas, and to members of specific ethnic groups. Mro, for instance, has fewer than 20,000 speakers. Bangladesh has one official language: Bengali, in which all business and education are conducted. In previous centuries, colonization and the spread of a global economy were the principal forces behind the extirpation of indigenous languages. Now, the internet plays a leading role in linguistic homogenization. English and Mandarin are the giants there: About half of all websites use one of those two languages. The Endangered Languages Project at UNESCO — the United Nations Educational, Scientific and Cultural Organization — estimates that, without intervention, nearly half of the 6,000 languages spoken around the globe today will disappear by the end of the century. With the disuse of indigenous languages comes the likely disappearance of the scripts in which they are written. At present, just five alphabets — Latin (the one used to make English-language characters), Arabic, Cyrillic, Chinese and Japanese — are used in the great majority of printed text. But it was the graceful curlicues of the Malayalam alphabet that first inspired Brookes’ project. He’s become a passionate advocate for protecting disappearing languages and scripts, but in the beginning, Brookes just wanted to try his hand at woodcarving. As he explains in his 2010 book Endangered Alphabets, the project began when some attractive pieces of cast-off lumber at Burlington’s Sterling Hardwoods caught his eye. With those planks, Brookes carved signs for family members. Then he thought to challenge himself by carving words in other languages, and found that he enjoyed the intense focus the project required. “Carving was extremely minute and finicky and demanding,” he says. That didn’t stop him from carving 14 planks for his first exhibition in 2010. Brookes soon branched out into threatened languages such as Nom (from Vietnam) and Bugis (from Indonesia); in each he carved translations of the United Nations’ Universal Declaration of Human Rights. As his passion for the project grew, Brookes took to the internet, creating both a blog and a Kickstarter campaign. (He also maintains a website with a gift shop offering merch such as T-shirts, mugs and even furniture featuring endangered alphabets.) The blog caught the attention of Maung Nyeu, a Bangladeshi national and doctoral student at the Harvard Graduate School of Education. Nyeu is also executive director of a foundation called Our Golden Hour. Founded in 2011, the charitable organization is dedicated to educating children in the Chittagong Hill Tracts and to preserving that region’s endangered cultural history. He contacted Brookes, and before long the two were collaborating not only on placing the plaques in schools but on a unique series of books. Nyeu’s ongoing project asks Bangladeshi students to have their parents or grandparents tell them stories from their own youth. After writing down the stories in their indigenous language, the students read them aloud to classmates. Scans of the pages and video recordings of the readings are uploaded to Dropbox, from which Nyeu retrieves and transcribes them. Those stories then become the very material that students will study to learn about their own language and culture. Brookes joined the project in his role as the founder, editor and publisher of the Champlain College Publishing Initiative, a program that gives students practical experience in print and electronic publishing. He recruited a team of students to design a series of educational books in several languages of the Chittagong Hill Tracts. When the books are complete, Brookes will use the $10,000-plus raised via Kickstarter to print them and ship them to rural schools in Bangladesh. They’ll be the first printed educational materials in their native languages that the students will ever see. Endangered Alphabets’ international connectivity does not stop there. Last summer, Brookes brought his exhibit to the Smithsonian Folklife Festival in Washington, D.C. In the tent next to his were singers and dancers from the Kalmyk Republic, a nation in the Caucasus Mountains that is, as Brookes describes it, “the last surviving outpost of the Mongols.” The Kalmyk language, too, is in jeopardy. Brookes carved for Badushov a plaque in todo bitchig, the ancient Kalmyk script. By coincidence, Badushov has authored a children’s book in the script, and aims to use the book to teach Kalmyk children about their history and culture. Brookes and Badushov met last month to discuss collaborating on Kalmyk-language educational materials.